How do I get a ramp for my place of business? The first launch of StopGap Guelph was in October 2015. We are currently exploring the potential for our next round of StopGap ramps to be built. Please email us your request and we will add you to our waiting list. If you are interested in registering for our next launch of ramps, simply fill out the StopGap Guelph Registration Form and email it to StopGapGuelph@gmail.com. Please note that our ramps can only be built to accommodate a one step entry and the step height must be a maximum of 8 inches. To create awareness about barriers in our built environment that prevent people from enjoying some of the amazing buildings and businesses our city has to offer. To help private businesses embrace the upcoming Accessibility for Ontarians with Disabilities Act (AODA) Built Environment Standard which in the near future will make it law for businesses to be barrier free. Whether you are a parent pushing a stroller or a wheelchair user, ramps simply make life easier. A ramped storefront is smart for business; it allows access for everyone regardless of their ability. WE will help gather volunteers and material donations so that inspired business owners can receive a custom built, portable, non-permanent ramp to suit your stepped storefront – for free! 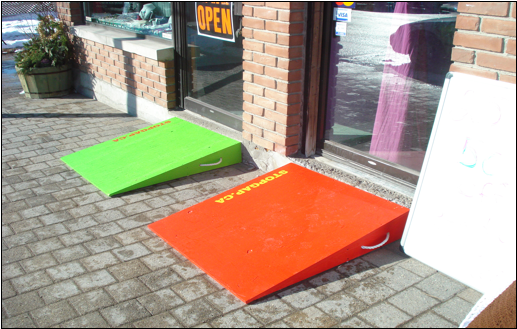 YOU will offer customers the use of your brightly coloured ramp on an as-needed basis and place signage in your window letting customers know a ramp is available upon request.